Getting more people playing more frequently in teams. The ECB Coach Education programme looks to develop the skills of everyone involved cricket. The two courses outlined below look to maximise the impact that individuals can have within their own club environment. 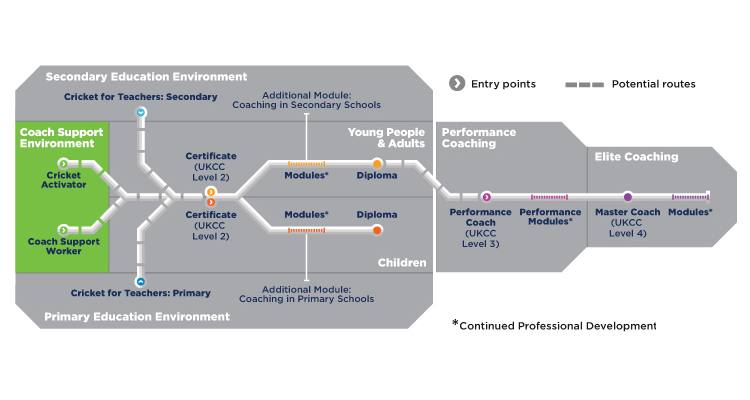 The two courses within the Coach Support Environment are both aimed at individuals who want to improve themselves without going through a formal training and assessment process. As part of the new ECB Coach Education programme two new courses have been launched to provide a first step on the coaching ladder. Both are typically run in clubs during the spring/summer months. The activators course is also run in schools. The course focuses on practical learning allowing you to understand how to make sessions safe; lead warm-ups and cool downs; and run different types of practice. You must be 16 years of age and complete a recognised safeguarding module (ECB Safeguarding Young Cricketers online workshop) and be DBS (Disclosure and Barring Service, formerly CRB) checked. This course is aimed at individuals who wish to assist under the direct supervision of ECB qualified coaches in the delivery of high quality practical cricket coaching sessions within a club environment. Please note that the courses within the Coach Support Environment do not provide a formal coaching qualification. The playing of cricket will not happen without a lot of things, which are often hidden to people, being done. If you want to make cricket happen, in whatever capacity, this course is right for you, especially if you are a young person exploring various options of how you can support cricket and develop yourself personally. The course will help you identify and understand the roles that make cricket happen and the development of ideas to promote cricket in your community. An ideal course for anyone wishing to volunteer in any way in organising cricket and signposts you to other opportunities to progress as part of the cricket community. After the workshop, you will then have the opportunity to get involved by making cricket happen in your environment. 2 x three-hour modules followed by 10 hours of volunteering in a cricket environment. Open to all, no upper or lower age limit. Planning and running a family fun day/fundraising event.